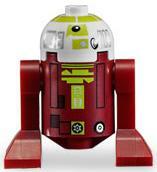 R7-A7 is a Star Wars: The Clone Wars minifigure introduced in 2009. R7-A7 has a White dome with Bright Yellowish-Green printing, and a Dark Red body with Bright Yellowish Green and Black printing. The legs are also Dark Red. R7-A7 was Ahsoka Tano's astromech droid, and was also a prototype unit designed for intuitive space combat solutions. He accompanied Ahsoka in a battle above Ryloth. R7-A7 was also rash and aggressive, and for this reason was paired with Ahsoka. R7-A7 was the first astromech droid to feature the Clone Wars styling. This page was last edited on 12 March 2016, at 01:15.